Stereokitchen uses a simple design strategy to create complex spatial possibilities and perceptual effects. 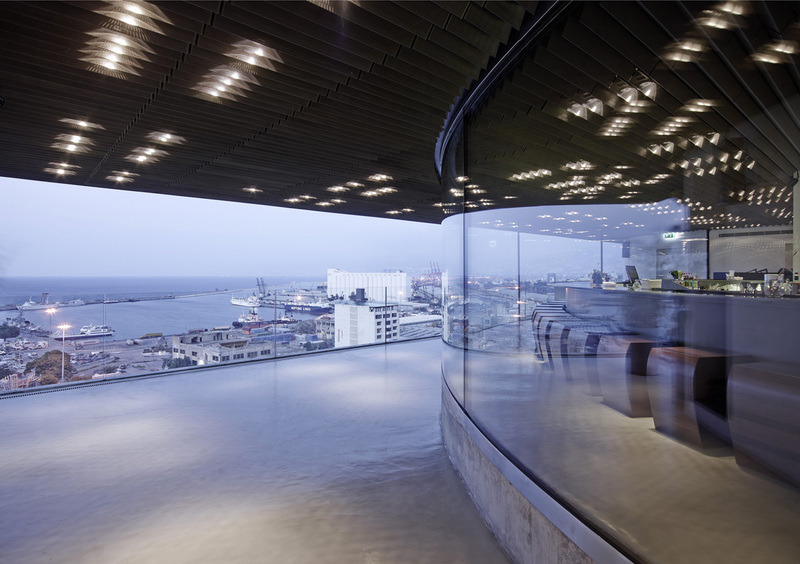 The restaurant bar is a simple glass pavilion on the last floor of an office building in Beirut. It enjoys views on the city, from one side the city and the Mediterranean sea with Beirut’s Port from the other. The top of the pavilion is constituted partly by the existing concrete slab and partly by an added metal structure cantilevering to cover the whole area below. The edge of the cantilever becomes very thin (2cm) and runs along the whole length of the facade (25meters) and the corner on both sides. The terrace “wrapping” the rounded glass volume celebrates the two opposite conditions of the crowded urbanity and the stretched wide horizon while creating ambiguous relations with the inside: one engages and perceives the “glass pavilion” in multiple ways depending on the light and time of the day or night, it could appear as a solid volume peeling open, revealing its interior or maintaining a certain amount of “opacity” and intrigue while the glass becomes once a window of display case of the people inside or a display case of the facing city.